100% Brand new and good quality USB Rechargeable Cigarette Lighter. 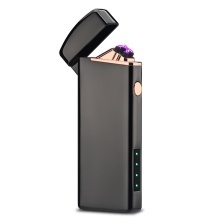 Dual Arc Cigarette Lighter, windproof and flameless, it is absolutely safe and easy to use. 100% Brand New & Good Quality Electric Cigarette Lighter. USB rechargeable design, which can be charged through connecting any device with USB port. With LED indicator light to show you the charging status. No gas or fuel is required, and it is windproof for it doesn&apos;t produce any flame. Absolutely safe and easy to use, and it will automatically power off after 10 seconds when not in use. Stylish design and delicate appearance, perfect gift for yourself or as a gift to friends.